While both boarding and non-boarding orphans benefit from the scholarships, priority is given to a specific segment of orphans, including the academically outstandingstudents, members of the public universities’ competitive system, the most indigent, in addition tothe students whose academic disciplines entail positive impact on the labor marketand hold a potential for further development. Mr. Ayeshhighlighted the importance of investing in the youth, and providing them with the opportunity to study, train, and work. Extending such support enables youth to interact positively within the community and encourages them to take on productive and active roles, allowing them to contribute to the process of development. He further added, “Supporting orphans at this criticalage of their lives is immensely vital, particularly orphans that residein orphanages, as it ensures setting them off on the right path.” The support provided by Nobles Investment strongly reaffirms Her Majesty Queen Rania Al Abdullah’s vision to support the education of orphans. Al-Aman Fund for the future of orphans is a non-profit organization registered under the Ministry of Social Development. It works to support orphans and young men and women across the Kingdom who experience the notion of an unidentified future uponreaching the age of eighteen.This includesorphans who have resided in orphan care centers,as well as those who live in poverty with extended relatives and are supported by orphan support organizations. Al-Aman Fund caters to the needs of young orphans byprovidingeducation and vocational training, securing living expenses and health insurance, as well as providing social, academic, and psychological counselingthroughout their study period. Her Majesty Queen Rania Al Abdullah initiated Al-Aman Fund for the Future of Orphans in the year 2003 and the organization was institutionalized in the year 2006. 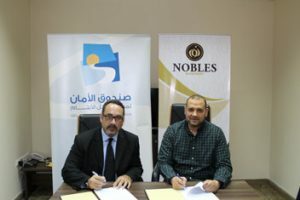 Noble Investment is an investment group that is active in several sectors, most notably real estate development and e-commerce, with projects held in Dubai, Amman, and Toronto, Canada.